Just like their owners, dogs are bound to feel a little sick from time to time. The illness often causes them to ignore their regular eating and drinking routine. This fasting prevents the dogs from getting the vitamins and nutrients they need to get over their illness, so it is very important you find a way to get something in their stomach. An easy way to do this is by providing them with a special meal they will not be able to decline. These are the nine best foods to feed your sick dog. Chicken is an excellent source of lean protein for both humans and dogs. It is also packed with vitamins that will help boost your dog’s immune system. The best way to prepare chicken for a dog is boiling in water without any seasonings. Once it is cooked, you will then shred it into small pieces. This ensures the chicken can be easily digested on by the dog’s upset stomach. The soft texture of baby food makes it extremely easy for dogs to consume and digest. It is also packed with flavour, which will entice a sick dog to have a taste. This is such a successful option that it is used by vets throughout the country as a quick and easy way to feed a sick dog. It is very important to avoid getting any foods that contain garlic or onions because they can’t be digested by dogs. If your dog is struggling with an upset stomach and diarrhoea, then it is time to start making some white rice. The soluble fibre in the rice absorbs any water in the intestines after it is consumed. This helps create more solid stool movements over time. You want to avoid using any seasonings when preparing the rice. Brown rice is not a suitable option because it is much harder to digest on an upset stomach. Pumpkin is loaded with vitamin A, manganese and dietary fibre, which naturally help boost the functioning of the digestive system. The best thing about pumpkin is that it does not require any hard work. All you have to do is pop open a can of store-bought pumpkin. The soft texture of the pumpkin makes it very easy to eat for any dog. Canned pumpkin also does not contain any unnecessary seasonings that can worsen a sour stomach. The same beneficial vitamins that are in pumpkin can also be found in sweet potatoes. Create a bland mash by boiling the sweet potatoes in unseasoned water for at least 30 minutes. Let it reach room temperature before serving to the dog. It is very hard for a dog to recover from an illness when they are dehydrated. Unfortunately, dogs often choose not to drink water when they are feeling sick. The best way to solve this problem is by feeding them some chicken broth. The smell of the chicken should entice the dog to drink the broth. Since it is primarily water, this will cure any dehydration concerns. Store-bought chicken broth is loaded with salt and other harmful seasonings so you will need to make your own. While the broth will eliminate any hydration concerns, it is still a good idea to find a way to get the dog to drink water. If your dog is not eating a lot of food, then they may start to suffer from low blood sugar. This will only exacerbate the tiredness and lethargy caused by their illness. 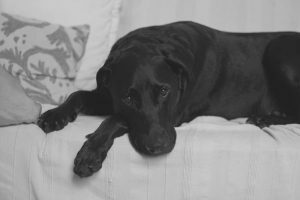 Your dog will not be able to start feeling better until their blood sugar levels go up. The easiest way to do this is by feeding them a small amount of Karo syrup. If the dog will not lick the syrup off your finger, then you can rub it directly on their gums. Eggs are an excellent meal for a dog that is vomiting. The eggs should be hard boiled or scrambled when getting served to a dog. Start with a very small portion. Gradually increase the portion size over the next few days. Once the dog is eating a normal portion with no issues, then you can return them back to their regular diet. Few foods contain more soluble fibre than oatmeal. The fibre helps prevents the bowels from evacuating prematurely, which makes it a great way to cure your dog’s diarrhoea. Thanks to its high fibre content, oatmeal can also be added to the permanent diet of older dogs with irritable bowel syndrome. Olivia Harper is the co-founder of the pet blog DailyDogStuff. She is a reserved and passionate pet parent who loves to spend time with her Sibe, who keeps her active and social. Read more of her guides and tips by visiting the site.